The days are short and the weather is cold, this time of year, and, here in Holland, that often means cold and wet, not snowy. Nevertheless, it’s the most popular time for open-air markets: Christmas markets, to be exact. Going to a Christmas market has become almost traditional in Holland in recent years. Originally, this meant going to Germany, but lately I’ve noticed more and more Christmas markets being organized here at home. 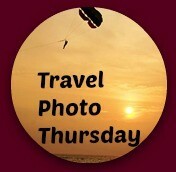 This weekend, I went to one over the border in Oldenburg, Germany, with my husband and daughter. The market, like most of its kind, is made up of dozens of small houses built of wood, open at the front with a counter to display items for sale. These booths are decorated to the hilt with strings of lights, pine branches, and so on. Behind the counter stand several warmly-dressed salespeople, generally not looking particularly happy, which is not surprising considering they’re standing out in the cold for hours on end in the middle of the winter! I’ve always been puzzled by this phenomenon. Don’t get me wrong: I enjoy going to a Christmas market, but, once there, I start questioning my own and everyone else’s general sanity. The people who work there: they stand there for hours each day, outside in the cold, to sell their wares to the customers who come by. Wouldn’t working inside a heated shop be a lot more pleasant? Of course, they do it of necessity because the customers are there, but that leads to my next puzzle: the customers. We bundle up as warmly as we can and go outside to shop. Why? After all, it’s cold outside! There are plenty of shops that are inside and have modern conveniences like heating. Yet we intentionally spend hours outside in the cold and dark, shopping. It’s crazy! And we eat and drink, while we’re there. In Oldenburg I’d guess half of the booths are selling food and/or drink. There’s nowhere to sit down, so we buy food and walk while we eat it. Why? There must be dozens of restaurants in the center of Oldenburg where they have modern conveniences like heating and chairs and plates. Yet we buy food and eat it walking. It makes no sense! Half of it ended up on my shirt this year. Then, because we’re so cold and walking around outside in the dark for hours, we need to warm ourselves up. The sensible thing to do would be to go inside somewhere where there are modern conveniences like heating. Instead, we drink. 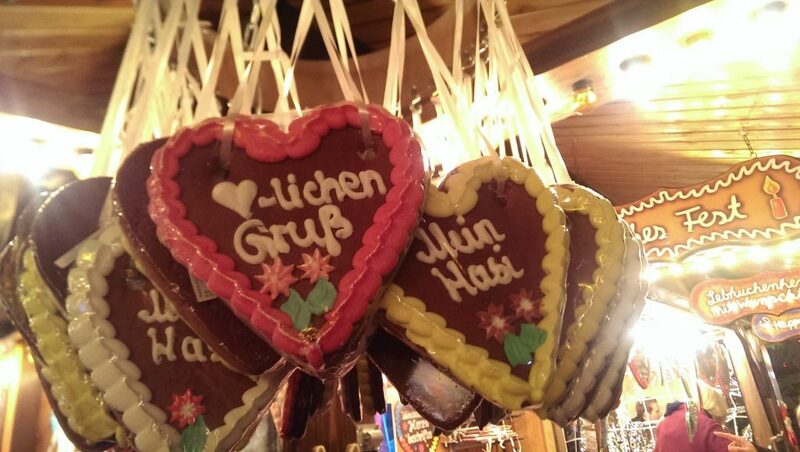 Generally, at the Christmas market, it’s all about glühwein. Glühwein is cheap red wine that’s been spiced and heated, and drinking it warms your hands on the mug and the alcohol feels warm from inside. Sorry about the blurry picture, but it gives you a general idea of how crowded the market was. And the longer you stay at the market, the more glühwein you have to drink. It’s part of the routine. 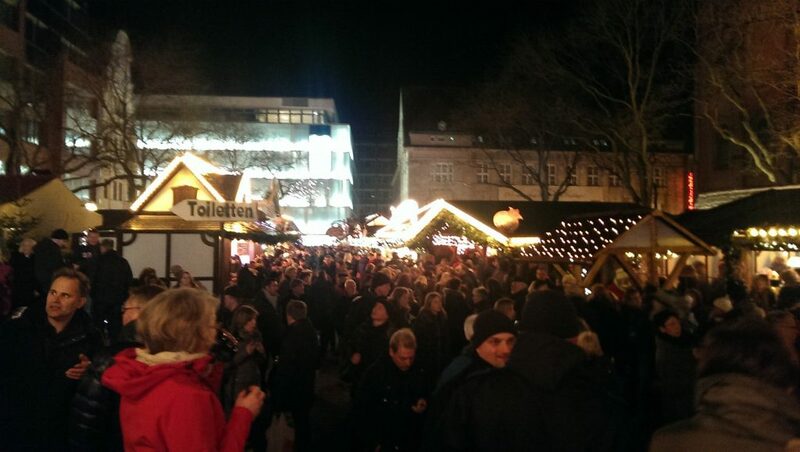 By far the busiest booths at the Oldenburg market this weekend were selling glühwein. Why do we do this? Why is shopping outside in the dark and cold (and rain this year) something that has become part of the Christmas tradition? Yes, the lights are pretty. Yes, sometimes there are unusual crafts for sale. Yes, there’s a Christmassy feel to it. But really, aren’t all of those things possible inside, with heat? Here’s wishing you all a very happy (and warm and dry!) holiday season, and a happy 2014! Put like this it does seem mad I agree, but I’m a great lover of the outdoors at anytime of the year…we often have winter BBQs, drinks around bonfires and winter picnics so I “get” the outdoor bit of Christmas markets! Having said that I’m in the south of France where the local markets rarely suffer from wet weather. Perhaps it would seem mad to wander around in cold rain! Thanks for sharing this interesting tradition, Rachel! I am guessing when people get cold they can go inside  I too love outdoors so I spend time outside in any weather! The warmer the better, I agree. But I love the refreshing feeling when you get in after a walk in the park with freezing temperatures. Thanks for commenting, Delia! I guess I’m just a warm weather person. I only enjoy the cold as seen through a window looking outside from a warm room! Oops, didn’t see yours, Phoebe! Thank you too! I wish we could trade! Yours sounds much more sensible to me. It’s not that I didn’t enjoy myself; I did. But that was mostly about who I was with: my husband and my daughter who was home for the holiday from college. And it wasn’t as cold this year as the last few times I went to a Christmas market. I think I’d much prefer yours in the south of France! Exactly! Strange, isn’t it? That we enjoy it despite spending all that time in the cold! I love open markets and all, but I can not do the cold. We have a few here that is partially outside and somewhat heated inside with dirt floors. I can only do them a couple times in the cold season. Just not a out doors type of gal. But so many ppl enjoy them and I am glad that they are there for them!. I’m with you, Margaret! Thanks for commenting!